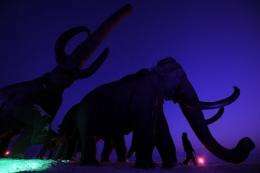 File picture shows giant bronze sculptures of mammoths in the Siberian city of Khanty-Mansiysk. Russian and South Korean scientists have signed a deal on joint research intended to recreate a woolly mammoth, an animal which last walked the earth some 10,000 years ago. The deal was signed by Vasily Vasiliev, vice rector of North-Eastern Federal University of the Sakha Republic, and controversial cloning pioneer Hwang Woo-Suk of South Korea's Sooam Biotech Research Foundation, on Tuesday. Hwang was a national hero until some of his research into creating human stem cells was found in 2006 to have been faked. But his work in creating Snuppy, the world's first cloned dog, in 2005, has been verified by experts. Stem cell scientists are now setting their sights on the extinct woolly mammoth, after global warming thawed Siberia's permafrost and uncovered remains of the animal. South Korean scientist Hwang Woo-Suk (L) and Vasily Vasiliev (R), vice director of North-Eastern Federal University of Russia's Sakha Republic, exchange agreements during a signing ceremony on joint research at Hwang's office in Seoul. The research collaboration agreement will help Russian and S.Korean scientists to recreate a woolly mammoth which last walked the earth some 10,000 years ago. Sooam said it would launch research this year if the Russian university can ship the remains. The Beijing Genomics Institute will also take part in the project. The South Korean foundation said it would transfer technology to the Russian university, which has already been involved in joint research with Japanese scientists to bring a mammoth back to life. "The first and hardest mission is to restore mammoth cells," another Sooam researcher, Hwang In-Sung, told AFP. His colleagues would join Russian scientists in trying to find well-preserved tissue with an undamaged gene. By replacing the nuclei of egg cells from an elephant with those taken from the mammoth's somatic cells, embryos with mammoth DNA could be produced and planted into elephant wombs for delivery, he said. Sooam will use an Indian elephant for its somatic cell nucleus transfer. The somatic cells are body cells, such as those of internal organs, skin, bones and blood. "This will be a really tough job, but we believe it is possible because our institute is good at cloning animals," Hwang In-Sung said. South Korean experts have previously cloned animals including a cow, a cat, dogs, a pig and a wolf. Last October Hwang Woo-Suk unveiled eight cloned coyotes in a project sponsored by a provincial government. This is awesome research. And it would definitely be possible to clone a Mammoth. Especially given that the specimen they have was so well preserved. Once they clone them, what will they do with them? Put them in a zoo? Let them roam free in Siberia? "controversial cloning pioneer Hwang Woo-Suk" Wow if that isn't the understatement of the decade. This guy falsified data and published results, did unethical research using his students..basically enough to put you away as a scientist in the US. But it seems Korea still holds him in high enough regard. very unlikely to succeed. i wish it was otherwise but why not take a look at the Pyrenean Ibex. it was within 10 yrs of its extinction and they had alot more material to work with and it was while being a huge success in how far they came compared to any other attempts and the odds they were facing it was still a failure and the end result of all the effort and extreme success still only lived 7 minutes before dying of massive lung defects. I think they'd probably set them free in Siberia. You guys sound like idiots, what you guys do not seem to realize is all cloned animals are brought into existence with many defects and mutations and never live long. It's fucked up for scientists to create these organisms that live a horrible existence being poked and prodded to death for sake of research. @Mick_Train. Hey foul-mouth, science is about learning and advancing the state of the art. Cloning has come a long way in four decades and will get more accurate in the future. I have no doubt that eventually cloning will perfected to the stage where its success rates are comparable to ordinary in vitro fertilization. As a result, numerous species will saved and even brought back from extinction. If we achieve this mammoth success, all we then need is to clone a few Cro-Magnon individuals, let them discover stone-flaking and how to make a spear-thrower, give them around 10 000 years and they'll evolve to invent IBM 360 computers, and cloning techniques for extinct Homo Sapiens. If humans are ever able to clone extinct animals without defects, new defects due to a genetic bottleneck would likely arise. They should release them in the Baldwin Mansion. I admit to feeling skeptical about the quality of the DNA they can recover from 10,000 year old specimens. But I don't think it's a bad idea to try. Sounds to me like they could probably pull it off. I have to agree with isdark, it would be neat, but this is publicity more than anything. The geneticist Webb Miller, a Penn State scientist who was part of the team that helped map the mammoth genome says not a chance. The DNA is a "mess", it is broken into immeasurable short pieces and contains postmortem damage. Plus trying to gestate a mammoth in an elephant would be like trying to gestate a chimpanzee inside a human. Both sets had common ancestors that diverged some 6 million years ago. There would be very low bio-compatibility. I wish them luck, their going to need a ton. The mammoth trudges around Siberia by the millions during a so called ice age but then ever trace is frozen solid for 10,000 years during a so called warm interglacial. Don't be a brainwashed sheep. A "definitely" you say? So far we never cloned any organism from dead cells. If nothing else, we should succeed with cloning of elephant first. Don't be a brainwashed sheep. Of course. What such cloning is good for, after then? Actually, there was one incident where they cloned the Spanish Ibex back into existence. But it died from a lung defect not long after birth. :( You're right, though - it's going to be a Mammoth task, so to speak.